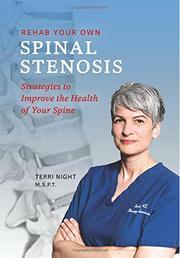 A seasoned physical therapist draws on her 25-plus years of knowledge about the causes and treatment options for spinal stenosis, a narrowing of the spinal canal. “Reading this book…will make you a more knowledgeable and prepared collaborator with your chosen healthcare practitioner,” says the author at the opening of her debut self-help book. Night keeps this promise throughout the work by breaking down intimidating scientific lingo with approachable graphics in three sections that focus on diagnosis, different types of treatment (including dealing with inflammation, exercise methods, and various other wellness techniques), and surgery. One graphic highlight, for example, depicts a stack of 24 Krispy Kreme donuts constituting the central nervous system within the spine; she uses the image of cutting the stack to illustrate how spinal stenosis impinges on nerves, potentially causing burning, pain, and weakness. Patients will value this and a wealth of other sketches that clearly show how the disorder puts pressure on the spine. Night’s consistent use of laymen’s terms also creates an approachable atmosphere for patients who might otherwise be intimidated. Readers may find themselves a bit confused about MRI scans, and how they relate to a subsequent diagnosis; the author says that MRIs are important, but they shouldn’t be a patient’s “be-all and end-all,” as they may not always provide an accurate anatomical picture. A few sections of the book veer toward the obvious, such as the “Strategic Exercise vs. Non-Strategic Exercise” chart (which tags strategic exercise as “Safe” and “Informed” and non-strategic as “Dangerous” and “Uninformed”) and tips on the proper way to use ice. For those knowledgeable about basic holistic health practices, such as proper nutrition, exercise, and a definitively positive attitude, the text will simply feed their common sense. But if patients are new to holistic health principles, the book will be a rich guide that will help them to begin taking responsibility for their own health. A thorough beginners’ guide to addressing spinal pain.